July has been a trying month so far. Started with some not so good personal news, followed up on July 4th by my twisting my left ankle and injuring it badly (kid ran out in the street right in front of my bike). My injury has definitely prevented me from spinning, and until recently it has hurt to sit at my loom also. Thank goodness I did not sprain my wrist, life would not be pretty without being able to use my hands in some way. 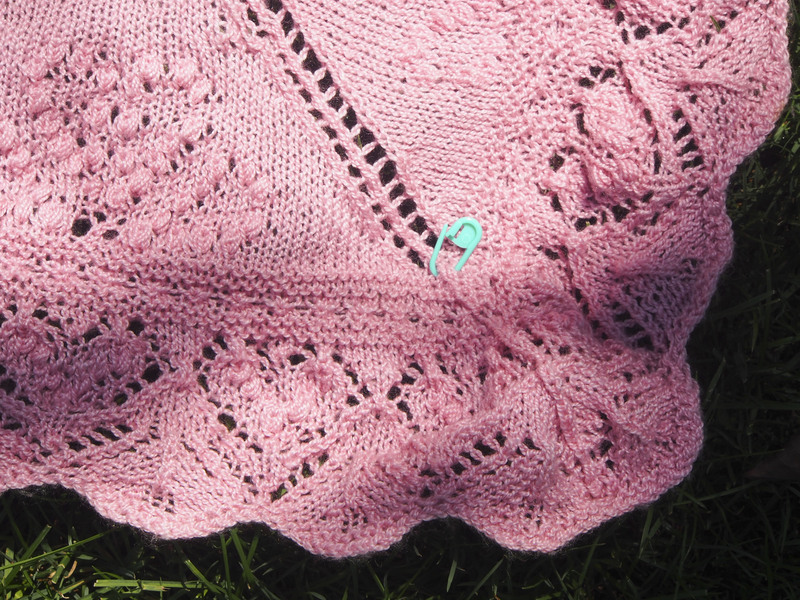 During this time I have been working on my Greta Garbo shawl, almost exclusively. 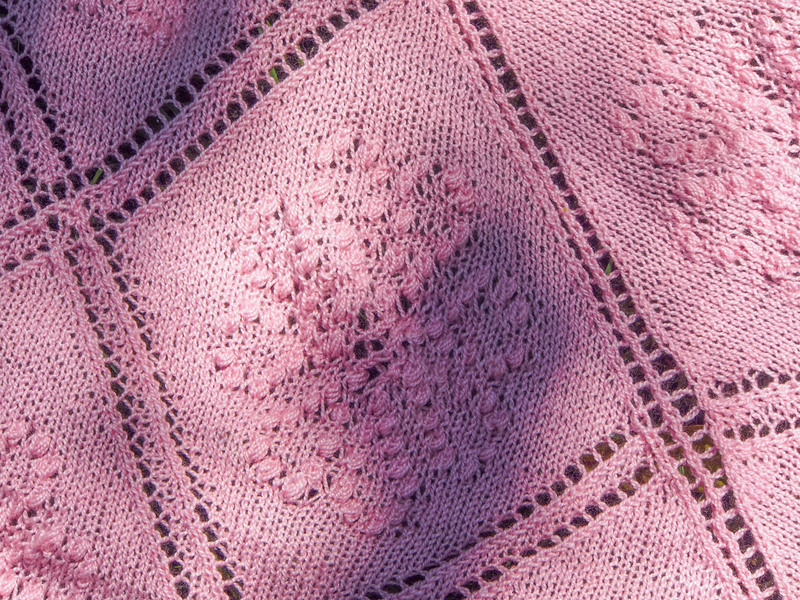 The knitting has been very slow going, it started with 475 stitches cast on, and then required me to rework the border as the stitch count did not line up with the pattern anymore. While that took awhile, it was well worth the effort. 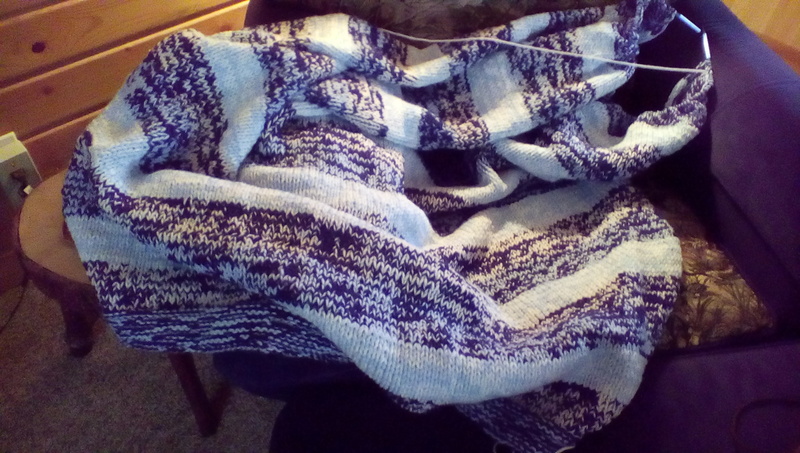 Then on to the knitting. Every other row decreases by 4 stitches, so it incrementally speeds up. 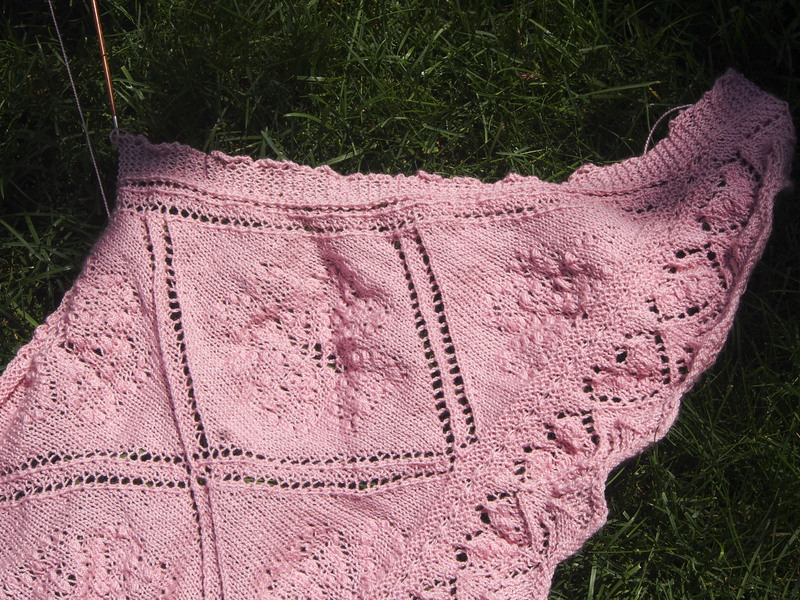 I am really happy that I cast on for the extra width, as the yarn that I am using is finer than the pattern called for. As you can see, I am getting close to the end. 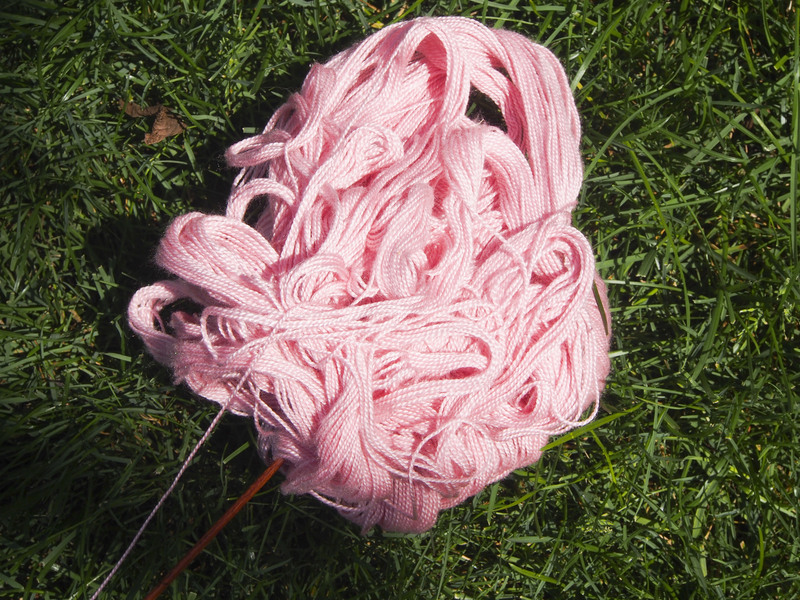 This time around, I have been much better at picking up all of the yarn in the nupps, or getting them on the following row. Only a few to correct prior to blocking. When I pulled out the shawl from my travel bag today, I was in for a surprise, as I had neglected to put the skein of yarn in a bag to protect it. Hopefully this will not be a problem! Thank you! The ankle is healing slower than I would like, but it did allow me to finish this! Just need to block it. 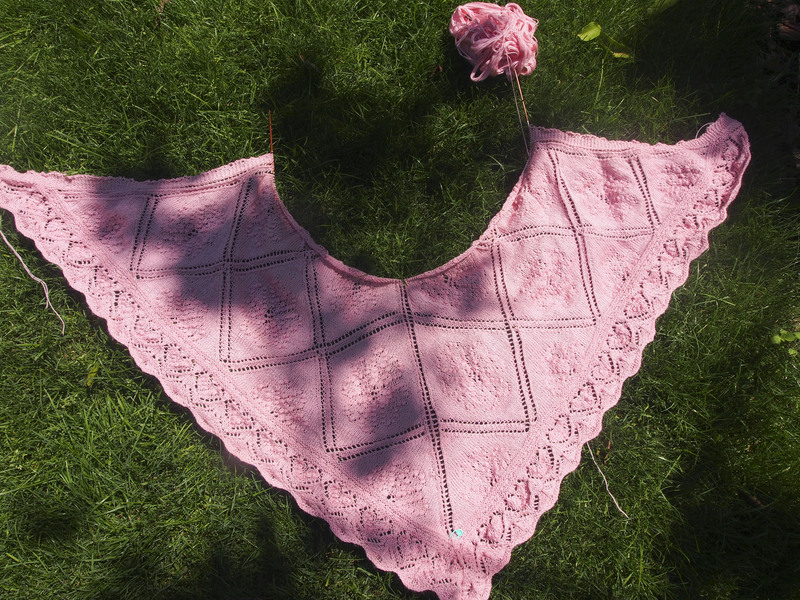 What a beautiful shawl!! Love how you did the border. Sorry to hear about your ankle….hope you’re better real soon. Thank you! I am really happy with the border also. Ankle thing has been a bummer for the summer. Last healing part is long, even with massage and accupuncture. Thanks for the encouragement.